A notorious kidnap kingpin, popularly called King Solomon, alleged to have been responsible for the abduction of several residents of Festac Town in Amuwo Odofin area of Lagos and environs, has been arrested by police in Lagos. One of his victims, as gathered, included the female Customs Officer attached to Tin Can Command SDV, a bonded terminal of the Nigeria Customs Service, who was abducted in the presence of her two daughters at an eatery on 22 Road, Festac Town, last December. Other victims include a pastor of a Pentecostal Church in Festac, identified simply as Pastor Nwachukwu, and two traders at Trade Fair. The suspect, whose real name is Chukwudi Solomon, used his apartment on 46 Canal View Road as a den, where abducted victims were kept. He was traced by undercover policemen from Festac Division, on Tuesday night. On noticing police presence, Solomon attempted to stab the DPO, but was overpowered. Three suspected members of his gang, who also attempted to prevent his arrest, were apprehended by policemen, who had cordoned off the building, while two abducted victims were rescued. During interrogation, the suspect revealed that some of his members, who had gone on a kidnap operation, were coming with a victim yesterday morning. 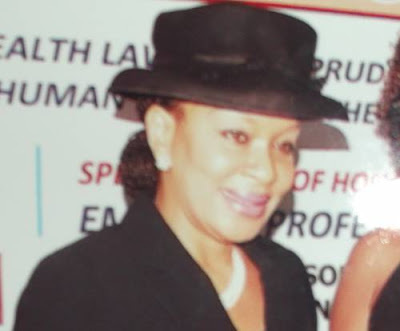 Justice Rita Ofili-Ajumugobia Weeps As EFCC Officials Search Her Home..